that's what little boys are made of, or so they say. This blog is to share the stories and everyday fun of our four boys, Bryce, Jarron, Jackson and Brody. Our life may be crazy at times but it is never boring! This week I got the privilege of being a chaperone for Moose's second grade class field trip to the Sharon Woods Heritage Village. Moose has been pretty excited about this for weeks. 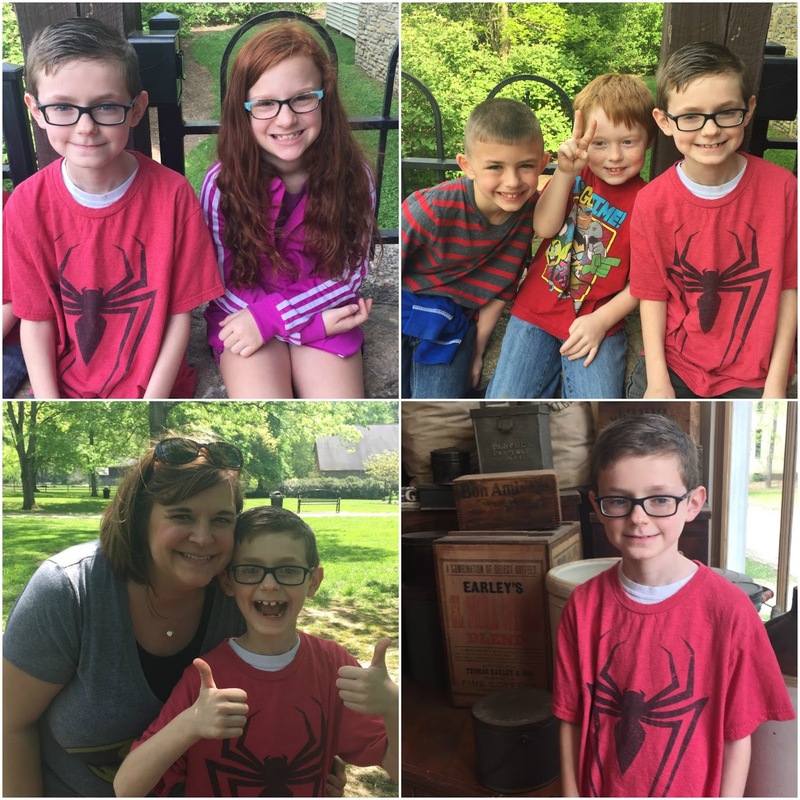 He loves going to new places and he loves it when his family visits his school. I just had a group of three kiddos to keep an eye on for the day, Moose, his buddie Gabe and another little guy named Landen. The day went by really fast-we had amazing weather-and with the exception of behavioral issue with one of the children at lunch, it was an awesome day. Moose has been to the Sharon Woods park a bunch of times but he's never been to the historic village area. I was really proud of how well behaved he was and how much enjoyed learning about the different village centers. So glad I was able to spend this time with him! Or you could also call it the end of basketball and indoor track season. However you want to say it, I am beyond thrilled to have my weekends back (sort of). The oldest boys were both supposed to run indoor track this year but one of them got a season ending injury (he'll be ready in time for Fall), so it was just me and Bryce driving all over Ohio for indoor meets. He ended the year with his best split in the relay and his best time running a 400M race. We'll take it. We also got to visit a whole score of colleges we may not have even had on our list-Bowling Green State, Ohio University, Cedarville University, and University of Findlay-one or two might make the official college visit list for next year. How crazy is it that my boys are going on college visits next year? And I'll still be going on field trips with my youngest. It's a weird stage in my parenting life. Speaking of my youngest, he also wrapped up his first year of basketball with Upward. He played great all season. Worked hard and scored some baskets. We were very proud of his positive attitude and his crazy good defense. Seriously, you should see this kid play defense. I'm pretty sure at some point the kid he was guarding just gave up. We loved the league we were in and highly recommend it for parents of kiddos just starting out in sports. Jackson also finished up another year of basketball-playing for the Township with his buddies. They made it to the first round of the tournament and lost a super close game to end their season. Glad he got to play with his best friends and have some fun! So where does that leave us? Jarron is finishing up driver's ed and will be taking his test in the next month or so to be our first child with a license to drive, but that's a whole different post. I would say that we suddenly have a lot of free time but looking at our calendar, between church activities and school commitments our weekends are already committed through May! At least we'll have a few more evenings free. I'm a working mommy of four amazing little boys. When I'm not working or playing superheroes, I can be found scrapbooking.